The Barcelona collection is unusual designs, made of unique laces. Light, delicate and extremely feminine wedding dresses. This is a offer for exceptional women! It happened; here is it – my own Barcelona. When I create a new line of dresses, I always try to prepare something that will be a breath of freshness on the market. Boho, for me it’s not only the trend in which fashionable wedding dresses are created, it’s above all the lifestyle. It is crazy, unbridled, combining a wealth of styles and textures. I love it for the possibilities it gives and for the fact that it is so difficult to enclose it in rigid schemes. It was this diversity that I tried to emphasize when designing a new series of dresses. Barcelona collection is an exclusive wedding dresses created with high quality materials. Although this style is extremely eclectic, it is associated primarily with the beach, nature, wedding in the forest and some kind of loose and nonchalance. I wanted to show that elegance does not interfere with it, and exclusive wedding dresses look great not only in sophisticated interiors, but also at weddings organized in vintage style, or rustic in a close environment of nature. In the new collection I present a completely different face of dresses in the boho style. It has other side, elegant and sophisticated, while leaving full freedom of movement and space. I have taken care of the variety of models and with a use of the best materials I have created the most beautiful wedding dresses for you. Selection of its name is also not random. Barcelona is an extraordinary city, with an unbridled soul. It captivates with its diversity, delights and charms – this is also my collection, which includes exclusive wedding dresses. When designing clothes, I focus primarily on comfort; hence I choose high quality, soft, crease free materials. Comfort is particularly important to me. I want the bride to feel good in the dress and not only to look great. Dresses in the latest collection are made, among others, of Spanish cotton lace, which are exceptionally beautiful and have a certain unusual feature – after the wedding they can be dyed and thus give the dress a second life and a completely new look. Barcelona is an unusual collection. I guarantee that you will not find such a solution in any other salon. Like my other projects, it is created in a very thoughtful way, so that the individual elements can be easily combined and give the whole styling an individual touch. The guiding model that inspired my creation is the ecru wedding dress, covered with lace in different styles, including Spanish lace of the same color made of cotton and decorated with tulle. But don’t let this deceive you – I still give you the opportunity to make changes and decide on details – I believe that this is how the most beautiful wedding dresses are made. In the collection you will also find other non-standard solutions, including an absolute breath of freshness and an alternative to the classic wedding suit. Yes, you see it right – the suit. 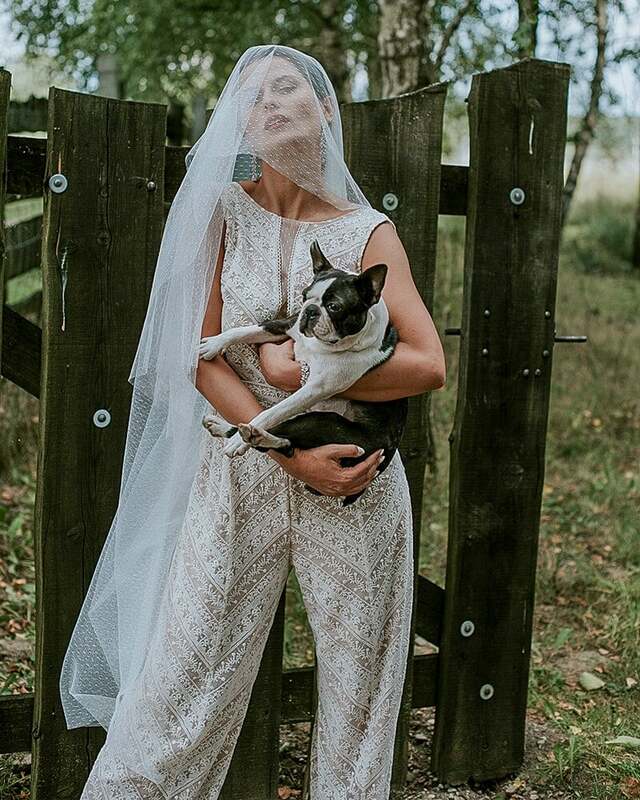 It is a combination of trousers and the top for the wedding is an unconventional solution for brave brides, but this is exactly what I like the most! I have always liked to stand out in style, which is why, as soon as I came up with the idea of creating a wedding suit, I immediately set to work. 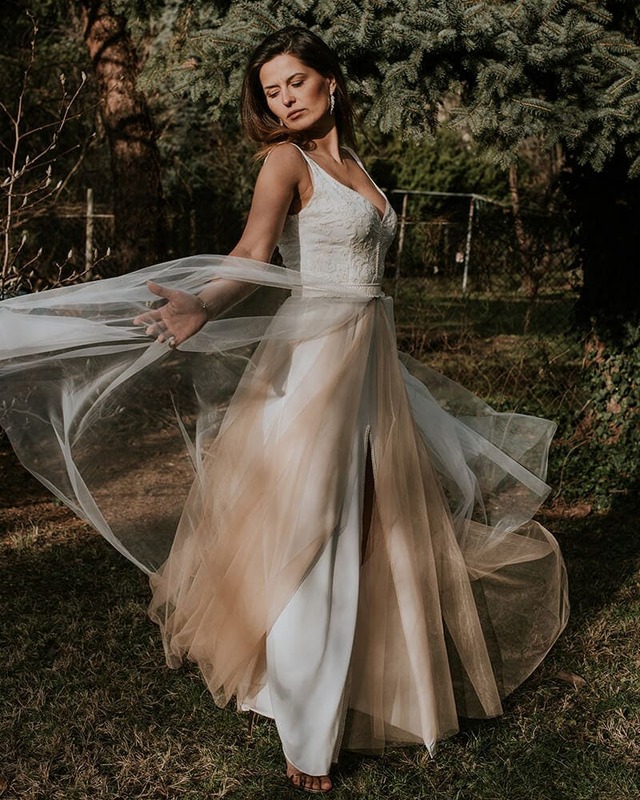 Ecru wedding dress, Spanish cotton lace, decorated with tulle – all kept in shades of beige and presented in subdued light, against the background of nature – I love such scenery. The closeness of nature and the natural look and materials used in the styling are the most beautiful combination to guarantee comfort and unusual appearance. Barcelona collection is a fashionable wedding dresses created with the highest quality fabrics. You can see the effects of work in the lookbook. There you will find a unique suit and classic wedding dresses – short, long, light and matching. I have prepared models with wide and narrow shoulder straps, but in the collection you will also find other variants such as a matching dress with short sleeves and a delicate collar. I hope that you will like the gallery and you will find a lot of inspiration. The creations included in the Barcelona collection are exclusive wedding dresses. You still have an influence on the appearance of creation, I want to give you the opportunity to change and influence the final shape of dress, and therefore depending on made modifications, the cost of workmanship may change. Prices shown next to each model refer to the project from the photo, so if you plan to make changes to the model, treat them as a guide. Now I invite you to see my wedding dresses catalogue. I have prepared for you proposals of fashionable wedding dresses of exceptional form, and therefore I hope that among the presented designs you will find not only your dream dress, but also a large portion of inspiration. Enjoy viewing!